Summary: Dimple Shah has it all figured out. With graduation behind her, she’s more than ready for a break from her family, from Mamma’s inexplicable obsession with her finding the “Ideal Indian Husband.” Ugh. Dimple knows they must respect her principles on some level, though. If they truly believed she needed a husband right now, they wouldn’t have paid for her to attend a summer program for aspiring web developers…right? Rishi Patel is a hopeless romantic. So when his parents tell him that his future wife will be attending the same summer program as him—wherein he’ll have to woo her—he’s totally on board. Because as silly as it sounds to most people in his life, Rishi wants to be arranged, believes in the power of tradition, stability, and being a part of something much bigger than himself. The Shahs and Patels didn’t mean to start turning the wheels on this “suggested arrangement” so early in their children’s lives, but when they noticed them both gravitate toward the same summer program, they figured, Why not? Dimple and Rishi may think they have each other figured out. But when opposites clash, love works hard to prove itself in the most unexpected ways. You guys. I had heard so much about this book leading up to its release, so naturally it was the one thing I begged my dad to buy me when he told me I could get a gift for finishing with straight A's after my first semester of college. (Believe me, Italian is hard.) I was so excited to immerse myself in an adorable, geeky romance that everyone else in the blogging community was swooning over. And let me tell you, Sandhya Menon did not disappoint. As the summary explains, Dimple is a soon-to-be college girl who has zero interest in following her parents' wishes of being the ideal Indian daughter, finding a husband, getting married, settling down, and raising a family. She's more interested in going out into the world and being a badass female coder, and that's why she's over the moon when her parents give her permission to attend Insomnia Con, a six-week program which results in the winner having their app developed and marketed with one of the biggest female names in the business. What Dimple doesn't know, however, is that the reason her parents gave her permission to go was that Rishi's family was having him go too, and they wanted to arrange their marriage. Which, as I'm sure you've guessed by now, Dimple is way less than ecstatic about. So the rest of the book is Rishi and Dimple trying to make things work -- first as friends -- while both keeping their end goals in mind -- which is a little conflicting, since Rishi's is marriage and Dimple's is her career. This book was so freaking cute, and I absolutely adored every second of it. 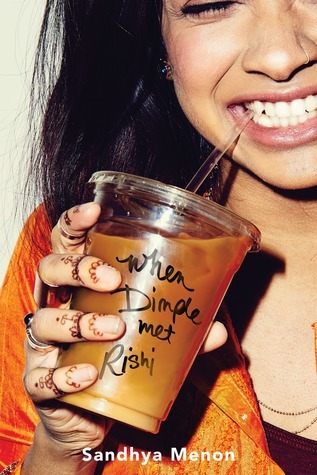 I tore through this book so fast because I loved reading about Dimple's sassy comebacks and Rishi's awkwardness and just seeing how the two of them managed to blend together and change one another in the best of ways, once they both stopped being so hard headed. All of their dates and romantic encounters were so freaking adorable that my heart is still melting even though I finished reading the book a little while ago. Seeing the way both of them navigated each other, Insomnia Con, and just figuring themselves out and what they wanted in life was so cute, and by the end of the book you definitely saw a progression. There was really only one part of this book that I wasn't crazy about, and that was the insta-love factor. If you've been a fan of this blog for awhile, you'd know that pretty much the one thing that really irks me in books is sometimes how quickly the characters fall for one another. At one point towards the beginning/almost-middle of the story, Dimple totally 180's from resenting Rishi's entire existence to somewhat tolerating him, and then kissing him and feeling herself falling for him. Falling in love with him. At some points in the story, I forgot that the entire time that they'd known each other was less than six weeks. Relationships can happen fast, don't get me wrong, but going from meeting (and hating) a total stranger to pledging your undying love for them in a little more than five weeks? That part bothered me just a little bit, but not enough for me to dislike the story, because even if it happened really fast, the relationship was still so dang adorable. I'm so excited to read this! I've heard nothing but good about it and it sounds right up my alley. Glad you liked it, great review!